TranslucentTB is a free open source program for devices running Microsoft's Windows 10 operating system that makes the Windows Taskbar transparent when run. The Windows Taskbar is one of the central locations to start and manage programs on Windows ever since Microsoft improved its functionality with the release of Windows 7. While functionality changed -- you can pin programs to the taskbar, and use new features like jumplists as well -- appearance options have not changed all that much. Back in 2015 I reviewed a new version of the popular application Classic Shell which shipped with functionality to make the Windows taskbar transparent. TranslucentTB is a standalone program that offers the same functionality. What you may like about it is that it is open source, portable, and pretty lightweight. How lightweight? It uses less than 2 Megabytes of memory when it is running and when you don't interact with the program in any way. In addition to that, it uses barely any cpu cycles when running. Note: Some security programs may flag the program as malicious. This is a false positive when that happens. You can verify that by scanning the application on VirusTotal. All you need to do to use the program is to download a release version from the project website, extract the archive, and run the executable file. 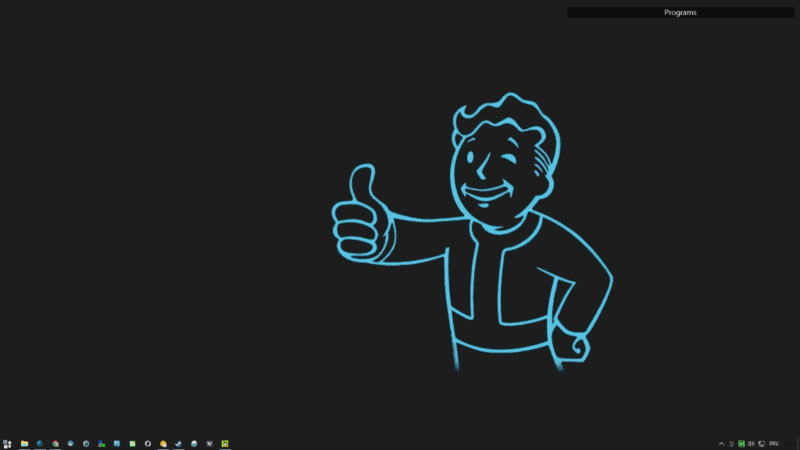 It will make the Windows Taskbar transparent right away, and place an icon in the System Tray. If you have the skills, you may also build the program yourself by cloning it on GitHub or downloading the source. A right-click on the program's system tray icon displays three options: to set the taskbar to transparent or blur, or to exit the application. Both visibility options do what you'd expect them to do. TranslucentTB supports a couple of additional features of interest. First, it works fine if you have multiple monitors connected to the computer. --opaque to display a solid color as specified by the --tint parameter. --tint COLOR to specify a 32-bit number in hex format for use with the --opaque command (format alpha, red, green, blue, e.g. tint 80fe10a4. The program does not autostart automatically with Windows. This means that it changes are gone whenever you restart your system unless you add it to the autostart. Press Windows-R to open the run box. Type shell:startup to open the main startup folder of the Windows operating system. Right-click the file TranslucentTB.exe to the startup folder. Select Create Shortcuts Here when the menu is displayed. If you want, right-click the shortcut and select Properties. Append any command you may want the program to start with to the Target field. TranslucentTB is a well designed program for Windows 10 that you can run to change the appearance of the Windows 10 Taskbar. The program is lightweight, open source, and in active development so expect new features to hit the next releases of it. There’s worse : a translucent area including clickable choices with click-through background : confusing. It amazes me how could have Microsoft thought that making things which pop out of the taskbar blurry but the actual taskbar just translucent without blur was a good idea. It looks so out of place. Classic Shell gives you a wonderfull glass-taskbar and a much better lookin start-button also . You can really chance almost everything in it , its fast and reliable , without it Win10 will become a big disgrace ! Use Classic Shell. Can you give translucent, fully opaque or fully transparent taskbar. Or even a textured taskbar. What do you mean? I just tested again in Windows 10 version 1809 and it works fine. Which version did you run, on which version of Windows, and what did not work? I’m using Windows 10 Home, Build 17763.rs5_release 180914-1434. I thought I’m using the most recent version. No matter what setting I choose the taskbar will not become transparent. This is too weird. I re-booted and now it works fine. Sorry to bother you. I just re-booted and it works fine. Sorry to bother you. This is a great software!